Although fairly new to MMA, Jeff Haddad has made quite an impact. The most literal form was his 3rd round head knockout of John McLaughlin. 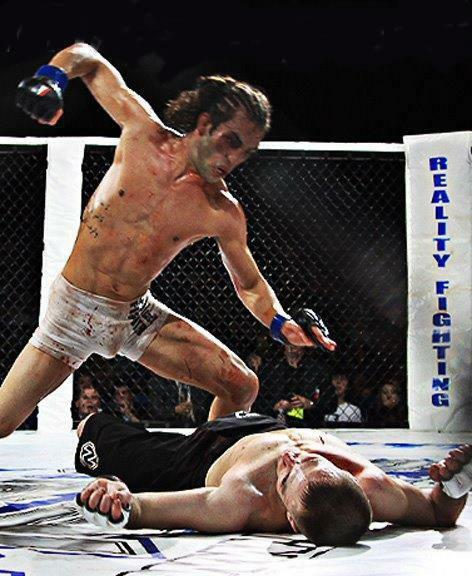 The come from behind knockout earned him the Reality Fighting Bantamweight Championship. There’s blood everywhere in the cage and the Reality Fighting DNA removal crew is working overtime. Haddad’s face is a mess and his mother isn’t gonna let him back in the house looking like that! Round 3: The friends come out smiling and they are circling. Haddad throws a lead leg head kick that cracks The Convict and John is OUT! End of story! We have a new Bantamweight Champ! Johnny is eventually taken out on a stretcher. This is KO of the Year materiel. Holy Cow! Where did that one come from? Emil had lost the first two rounds soundly. He had a busted nose that was leaking like a broken faucet when out of no where he hit McLaughlin like a rented mule! Haddad stole one from the Convict. What I want to know is how does a fighter make weight at 135 lbs when he has 140 pounds of balls? !